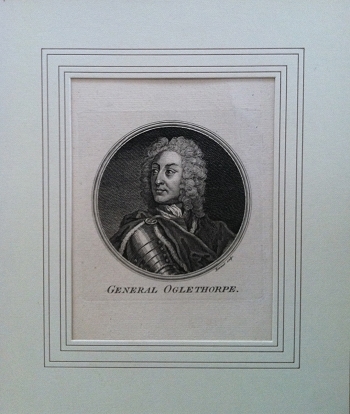 A scarce and significant image of General James Oglethorpe, the philanthropist and warrior who founded Georgia the last of the 13 original colonies. It is a copper engraving by Ravenet, dated 1757, documentation on reverse. Image is 4 1/2 x 6 inches, 8 x 9 1/2 matted with French mat.